3,300 year old coffin of wealthy Canaanite working for Egypt, buried with gold scarab seal of Pharaoh Seti I, father of pharaoh from Exodus. A 3,300 year old Egyptian coffin, an important ancient artifact, was found in the Jezreel Valley in northern Israel during a natural gas pipeline excavation, according to a statement published by the Israel Antiquities Authority (IAA) on Wednesday. During the natural gas salvage excavation, a burial site from the Late Bronze Age (13th century BCE) was discovered at the foot of Tel Shadud, in the Jezreel Valley. 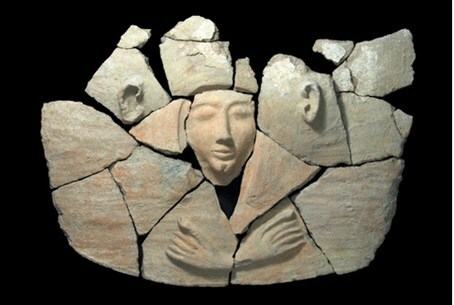 The unusual coffin found at the site is thought to have belonged to a wealthy Canaanite. 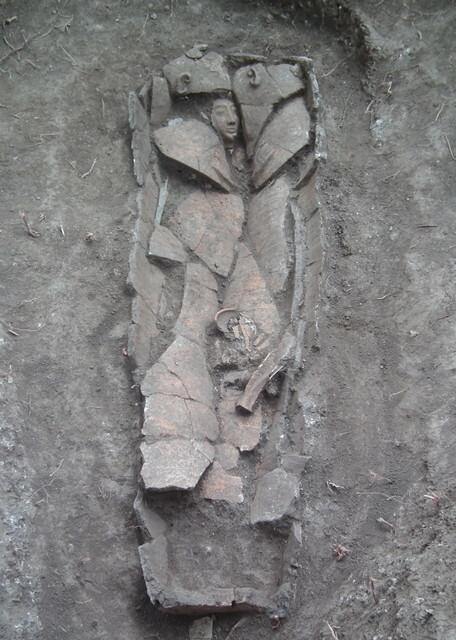 “During the excavation we discovered a unique and rare find: a cylindrical clay coffin with an anthropoidal lid (a cover fashioned in the image of a person) surrounded by a variety of pottery consisting mainly of storage vessels for food, tableware, cultic vessels and animal bones," stated IAA excavation directors Dr. Edwin van den Brink, Dan Kirzner and Dr. Ron Be’eri. Inside the clay coffin an adult skeleton was found, and beside it was buried pottery, a bronze dagger, a bronze bowl and hammered pieces of bronze. “Since the vessels interred with the individual were produced locally”, the researchers say, “we assume the deceased was an official of Canaanite origin who was engaged in the service of the Egyptian government.” Another possibility is that the coffin belonged to a wealthy local who imitated Egyptian customs. Researchers stress that only several anthropoidal coffins have been found in Israel, the last being unearthed at Deir el-Balah roughly fifty years ago. The new discovery demonstrates Egyptian control of the region during the time period. "An ordinary person could not afford the purchase of such a coffin. It is obvious the deceased was a member of the local elite,” remarked the researchers. The graves of two men and two women who may have been members of his family were also located near the coffin. 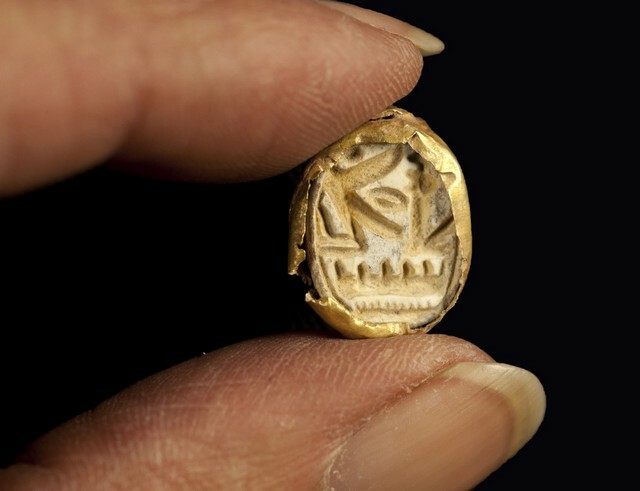 Aside from the coffin, a rare Egyptian scarab seal encased in gold and affixed to a ring was found alongside the skeleton. The scarab, used to seal documents and objects, bears the name of Pharaoh Seti I, who ruled ancient Egypt in the 13th century BCE. Seti I was the father of Ramses II, identified by some scholars as the pharaoh from the Torah's account of the Exodus from Egypt. Seti I put down a revolt in the Bet Shean Valley, located not far from the new find, in the first year of his reign (1,294 BCE). After conquering the region, the pharaoh established Egyptian rule in Canaan. The seal features the winged Uraeus (cobra), protector of the pharaoh’s name and person. Tel Shadud preserves the biblical name ‘Sarid,’ with the ancient mound often referred to as Tel Sarid, and a nearby kibbutz being named Kibbutz Sarid. The biblical city Sarid, located in the tribe of Zevulun's territory, is mentioned in the Torah in context of Joshua's conquest of the land. The city became a border city, as recounted in the Book of Joshua (19:10): "the third lot came up for the tribe of Zevulun, according to its families. And the territory of its inheritance reached as far as Sarid.” Tel Shadud is strategically and economically significant due to its location along important roads from the biblical period. IAA is currently considering sampling the DNA from inside the coffin to see if the deceased was originally a Canaanite, or an Egyptian buried in Canaan.